1.Preheat oven to 350°. In large bowl, whisk together eggs and milk. In second large bowl, mix breadcrumbs, cornmeal, salt and cayenne. Spray rimmed baking pan with nonstick cooking spray. 2.Add half of shrimp to egg mixture. With slotted spoon, transfer shrimp to cornmeal mixture, allowing excess egg mixture to drip off. Toss shrimp to coat, then place in single layer onto prepared baking pan. Repeat with remaining shrimp. Spray shrimp with nonstick cooking spray. Bake 10 to 12 minutes or until shrimp turn opaque throughout and reach an internal temperature of 145°. 3.Slice loaves of bread horizontally in half, but do not cut all the way through. 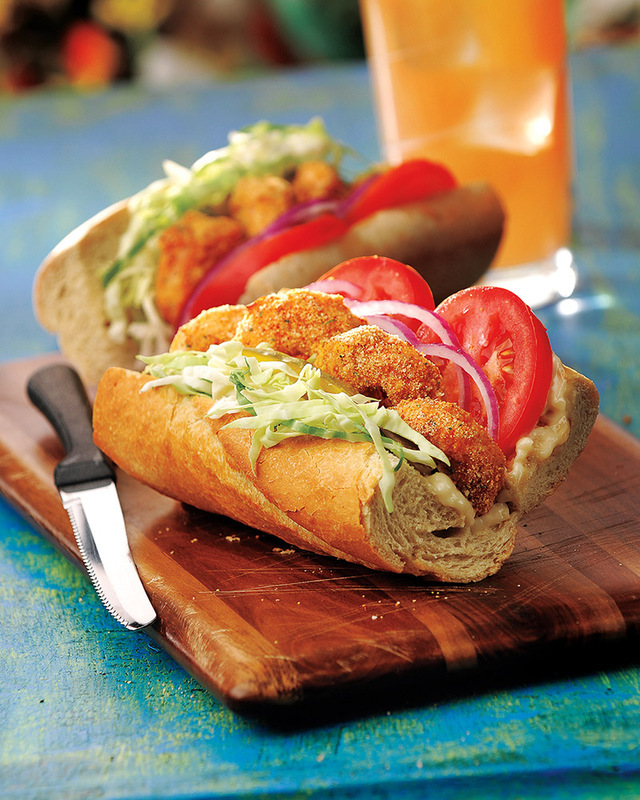 Spread both sides of bread with mayonnaise; fill with shrimp, pickles, tomatoes, cabbage and onion. Cut each loaf crosswise into 4 sandwiches to serve. For a gluten-free version, try using a gluten-free wrap or roll and make sure all other ingredients are gluten-free. To make lower carb, roll up in a large collard green or romaine leaf. This would be great paired with a crisp salad or lemon-roasted vegetables.